Just about everyone has heard a fair share of myths about hypnosis. What is it really, and how can it be used to help you live your life more effectively? The phenomenon we call hypnosis has been around for thousands of years in one form or another. Modern hypnosis traces its roots to Anton Mesmer's (1733-1815) animal magnetism. Today, hypnosis is a recognized therapeutic tool in psychology and medicine. Many attribute the modern practice of hypnotherapy to Milton Erickson (1901-1980), who developed it into an art form, beginning with his own dramatic journey of self-hypnosis from a near-death, quadriplegic state from polio at age 17. The combined scientific and clinical development of hypnosis for use in psychotherapy continues to progress. By definition, hypnosis is largely an attentional phenomenon. In broad terms, hypnosis involves a narrowing of the cone of attention. When an individual focuses attention on specific phenomena to the exclusion of other stimuli in the immediate environment, the state which we recognize as hypnosis exists. This is in contrast to sleep, in which the attention is essentially switched off. Hypnosis has a different brain wave pattern from sleep, similar to that of wakefulness. You might recognize this state as the one in which you have arrived home in your car unable to recall how you traversed the last several miles. Erickson termed this phenomenon the "common everyday trance". Individuals trained in the use of hypnosis as a therapeutic modality do not purport to control their clients nor to cause them to act outside of their choice, in contrast to the stage hypnotists with which many people are familiar. In fact, it is often said of clinical hypnosis that it is all "self-hypnosis" because the client is merely allowing the clinician to facilitate a new modality for learning. Clinicians use a variety of methods for facilitating hypnosis, but there is little mystique about the process. Each step of the hypnotic induction invites the client to narrow the attention still further. And while it is true that individuals may recall things under hypnosis that were not available to their conscious memory and that they may find themselves able to perform unusual actions such as suspending an arm in the air without fatigue, the client always has the choice of whether to engage in these behaviors. And, as I tell my clients, if the smoke alarm goes off during hypnosis, they will be the first out the door to safety. What Does Hypnosis Help With? Clinical hypnosis is an amazingly versatile tool with numerous applications. 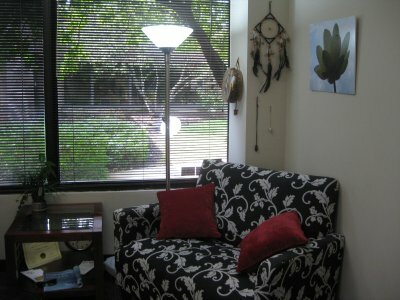 For example, hypnosis has been demonstrated to speed recovery from surgery, facilitate healing in burn patients, offer anesthesia for surgical procedures for individuals for whom the chemical anesthesia is hazardous, relieve pain, alter the progress of auto-immune disorders, decrease anxiety, and facilitate the specialized learning process we call psychotherapy. Individuals have been assisted to lose weight or quit smoking using clinical hypnosis. And aside from specific therapeutic goals, clinical hypnosis and the related practices of guided imagery and relaxation have been shown to enhance immune system function and improve an individual's sense of well-being. Many people are curious as to whether they can "be hypnotized". The ability to enter hypnosis seems to be partly learned and partly inherited. As is the case with other skills, such as typing or ballroom dancing, most individuals can learn to experience hypnosis. Some people show a "talent" for entering deep hypnotic states relatively rapidly, while others require more practice or may be able to experience lighter stages of hypnosis. Deep hypnosis is not necessary for most therapeutic benefits. Dr. Carol Low at the Center for Conscious Living is trained in the use of clinical hypnosis for a variety of learning and growth experiences and has earned her Approved Consultant status from the American Society of Clinical Hypnosis, teaching other professials to use this powerful learning modality with their own clients. Please call and to ask about the use of clinical hypnosis, which is known to facilitate progress in therapy and offer more control over your behavior.